Extracurricular activities, child care and education can add up quickly. 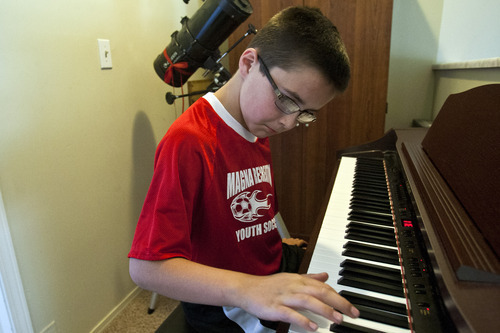 Chris Detrick | The Salt Lake Tribune Danny Fish, 9, practices the piano at his home in Magna on Thursday, May 30, 2013. 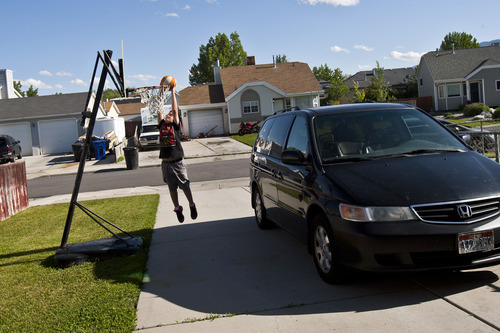 Chris Detrick | The Salt Lake Tribune Brady Fish leaps off of the van to dunk on the basketball hoop after his Scout meeting in Magna on Thursday, May 30, 2013. Chris Detrick | The Salt Lake Tribune Laurel Fish, 16, and her sister, Natalie, 17, wait at Cyprus High School before a choir concert in Magna on Thursday, May 30, 2013. 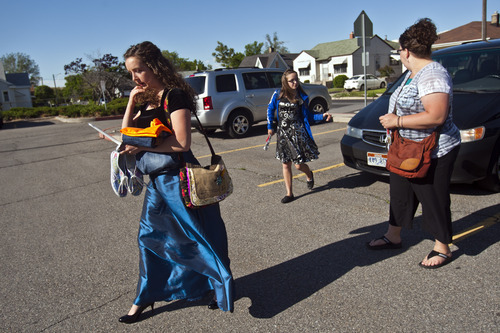 Chris Detrick | The Salt Lake Tribune Natalie and Laurel Fish and their mom, Becky, walk to Cyprus High School before their choir concert in Magna on Thursday, May 30, 2013. 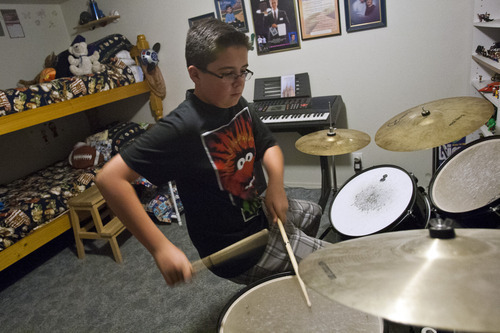 Chris Detrick | The Salt Lake Tribune Brady Fish, 12, practices the drums in his bedroom at his home in Magna pn Thursday, May 30, 2013. 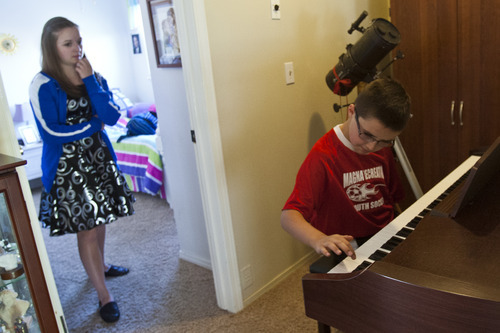 Chris Detrick | The Salt Lake Tribune Laurel Fish, 16, watches as her brother Danny, 9, practices the piano at their home in Magna on Thursday, May 30, 2013. 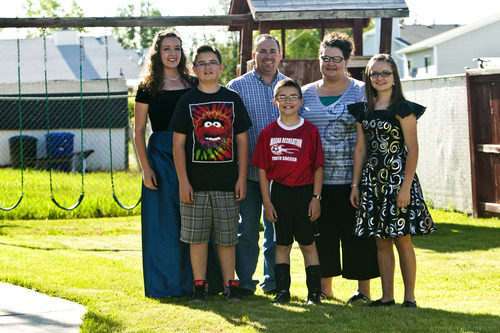 Chris Detrick | The Salt Lake Tribune The Fish family: Natalie, 17, Brady, 12, Derek, Danny, 9, Becky and Laurel, 16, at their home in Magna on Thursday, May 30, 2013. 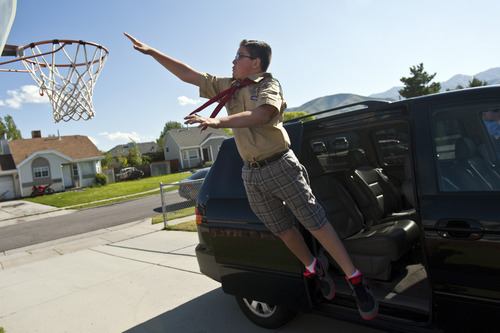 Chris Detrick | The Salt Lake Tribune Brady Fish dunks the ball on the basketball hoop after his Scout meeting in Magna on Thursday, May 30, 2013. Chris Detrick | The Salt Lake Tribune Becky Fish gives her son Brady, 12, a sandwich as part of his dinner in their van after picking him up from his Scout meeting on their way to her daughters' choir concert in Magna on Thursday, May 30, 2013. 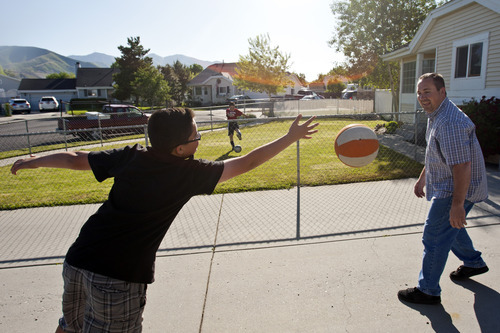 Chris Detrick | The Salt Lake Tribune Brady Fish and his dad, Derek, play basketball while his brother Danny, 9, practices soccer at their home in Magna on Thursday, May 30, 2013. Chris Detrick | The Salt Lake Tribune Becky Fish watches as her son Danny, 9, puts on his soccer cleats at their home in Magna on Thursday, May 30, 2013. Thursday night the Fish family was fully booked. Brady, a sixth-grader, and little brother Danny had Scouts until 5:30 p.m. Then, it was off to practice piano and drums. By 7 p.m. Laurel, 16, and Natalie, 17, were participating in the final school choir performance for the year while Danny went to his soccer game. Parents Becky and Derek divided and conquered. As any busy family knows, juggling all these extracurricular activities can be a time crunch. But it can also put a dent in the parental wallet. Becky Fish said in May the family spent $300 for Laurel&apos;s private driving lessons, $500 on a birthday road trip, and extra cash on graduation gifts for Natalie and promotion gifts for Brady. And that all comes on top of the usual costs for clothes, toys, sports fees, Scout camps, choir outfits and piano lessons. "This is a hard month," she said. Raising children has never been a cheap proposition, but if you feel your budget being stretched by kid costs, you&apos;re not alone. A recent study looking at trends in family economics since the 1970s shows a steady increase in the amount of money parents are spending on their children. And the portion of income parents are devoting to children is going up, even as family sizes shrink, says Sabino Kornrich, postdoctoral fellow at the University of Sydney and co-author of the report, "Investing in Children: Changes in Parental Spending on Children." "We really can&apos;t say why parents are spending more," Kornrich said. "In general, it seems that college admissions and the job market have become much more competitive, increasing parents&apos; incentives to invest in children. But we didn&apos;t have any data on parents&apos; motivations, so we aren&apos;t sure." No matter the reasons, the trend can&apos;t be ignored. In 1973, parents spent an average of $1,106 a year per child on education, child care and accessories; in 1984, the cost jumped to $1,713; in 1995, the total was $2,081; and by 2006, parents were spending $2,217 a year on a child (data come from the U.S. Bureau of Labor Statistics and dollar values were adjusted to 2008 dollars). The authors describe those averages as "conservative" estimates that may under-represent what parents actually spend on children; households with children living away from home who were still getting parental support were excluded from the study, for example. In total, it now costs middle-income families about $235,000 to raise a child through age 17, including the costs of food, housing, health care, transportation, education, child care and clothing, according to 2012 data by the U.S. Department of Agriculture. And that&apos;s before college tuition. Kornrich said parents from all income brackets are spending more on their children, although those paying out the most are college-educated parents and parents in the top 20 percent of earners, "probably because their incomes have increased faster than incomes for households through the rest of the income distribution." Perhaps not surprising to working parents and those with college-bound kids, child care and education represent the biggest chunk of the spending, with the most expensive years occurring before age 6 and after age 18. From the prevalence of extracurricular activities to the expectation of having the latest pocket electronics, the increasing cost of parenting doesn&apos;t surprise Brigham Young University associate professor of personal and family finance Craig Israelsen. But he does note that he&apos;s seen one segment balloon in cost over the past decade: youth athletics. He said that sports camps are now offered year-round in pretty much any sport, and if a child attended camps back to back it "could cost $30,000 a year." "When I was young, if you wanted to play basketball you played at the school down the street," he said. "Now you can send your child to tournaments in Hawaii. It&apos;s a costly world." And he suspects many parents link the extra expenses to boosting a child&apos;s college prospects, believing  rightly or wrongly  that sports camps, music lessons and college prep courses could lead to a scholarship and, ultimately, financial success. "In Utah, our society is very college-centric," Israel­sen said, "The pressure to get into college is measurable … and that pressure translates into costs." Investing in their children&apos;s future has always guided Becky Fish&apos;s spending priorities. The Magna stay-at-home mom says she and her husband, Derek, shop around for affordable but worthwhile extracurriculars and scrimp to make sure the couple can squeeze as many kid activities as they can out of their $67,000 annual budget. "We live in a small house and drive older cars, but we&apos;ll do everything to we need to do to make sure our kids go to college," Fish said. The investment appears to be paying off. Daughter Natalie will attend BYU-Idaho on a full tuition scholarship in the fall.